Remember when companies deployed Nextel phones solely for their push-to-talk (PTT) capabilities? With the press of a button, a caller could enable walkie-talkie-like communications with the office or a co-worker. When you tap and hold the Talk button, you can record a message of up to 30 seconds. When you're done, the message is immediately delivered to the selected recipients. Think how incredibly handy that would be for, say, notifying a sales team of an upcoming meeting, or letting your employees know about a new promotion. Sure, you could accomplish the same thing with an e-mail or text message, but your voice can convey a lot more than just raw text. Plus, sometimes it's way more convenient to say what's on your mind than it is to type it. 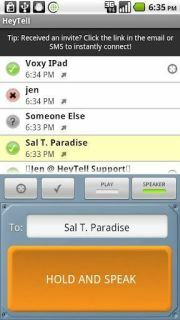 If there's a catch to using HeyTell, it's that everyone in your circle must have the app on their Android phone or iPhone. (For any contact who doesn't have it, you can send an invitation via e-mail or text.) But once it's installed, it alerts users via push notification when a new message arrives, just like with a text message. Amazingly, HeyTell is a free app, though there's one $1.99 add-on you might want to consider: Groups, which lets you create groups of up to 25 people for faster, easier message broadcasting. Although this doesn't recreate PTT in the strictest sense, it's a great way to exchange voice messages in something close to real time. If you've found a better walkie-talkie app, let me know about it in the comments.